I never realized he lived in Wisc.! I'm sure he told me, probably more than once, but I always thought of him as a Bronxite and New Yorker. Long live Ben Masel. Long live Ben Masel. I knew the man briefly from talking to him at various events. Voted for him in his run against Thompson(for which I had to register Republican(sic) and then received their propaganda for a couple of years). Ben was a good person. I have already seen it suggested that he got what he deserved(lung cancer). But, the fact is you can get lung cancer from a lot of different reasons, there are people out there that have gotten lung cancer and never smoked anything in their whole life. But, it is all a mystery as to why Ben got his as there are recent studies that suggest that reefer protects you from lung cancer. At least they show that chronic users are less likely to get lung cancer than those that don't even smoke, and certainly less than those that smoke the legal tobacco. 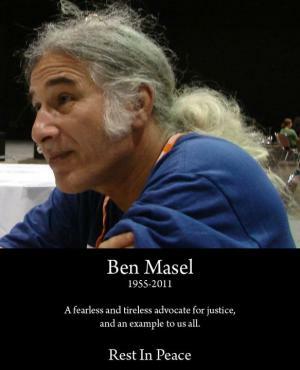 As I said before, Long Live Ben Masel. I found myself. Last night, I read about Eddy Lepp so I am sorry for him in the federal prison. I got to read the news here today. I relieve that Ben Masel experienced throughout the national marijuana policy conferences. We thank for him as fought for U.S. government law. In Wisconsin country is so great. Shall we have a new "Sachs Law" why not new book call is "Cannabis Botany Chapter"
Medical Association suppose to take care of the marijuana legal, not Federal Gov..
Harry Anslinger should put the death penalty for murder case.